The dining room is often the hub of home entertainment and where most meals are had, and because of that, it is important to find the right dining table to accommodate your family and friends. A quality dining table can last for decades, you want to search for one that is not only practical, but that will also fit the overall transitional mood of your dining room or area. At Consignment Furniture Showroom, we sell a variety of quality and affordable finding room furniture. Because finding the right dining table for your space is not always as simple as it seems, we are going to go over some tips to make the process easier. As you are deciding which dining room set to purchase, consider how often you have friends or family over, and how many people typically attend. If you have family or friends that live nearby and often come over to your place, it may be worth investing in a larger dining table if the space allows for it. Oppositely, if you don’t have guest very often, a large table may not get used as much. If you prefer to have options, purchase a dining room table with a table leaf so you can accommodate guests but still have a smaller option for more intimate gatherings. Whatever the size, make sure it will fit in your space. Take measurements of the table and think about chair movement to make sure that you and your guests can get in and out without much effort. The shape of your dining table can be just as important as the size — round and square dinner tables promote conversation and socialization, while large, rectangular dining tables are great for larger gatherings. If you prefer a dinner table that mixes the traditional and contemporary styles, consider outfitting a large room with an oblong or octagon table. The material is mostly governed by the overall style of your dining space, after all, your furniture should reflect your style and taste. Darker woods, such as cherry and mahogany, are often seen as an elegant and more traditional option, while dark metals, concrete, and lighter wood mixtures are considered contemporary. Think about the style of your dining area to determine what material is the best fit. 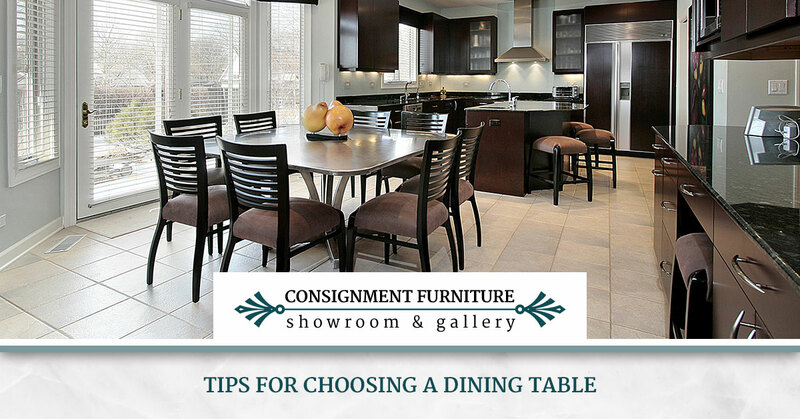 Whatever kind of dining table you need, you’ll find your perfect, like-new quality dining room tables and chairs for about half the cost of retail at Consignment Furniture & Gallery.